Hello, and welcome to the third episode of the Software Carpentry lecture on software engineering. In this episode, we'll have a look at agile software development, a collection of techniques and practices that many people believe fit well with how researchers actually work, and that are a natural step up from what many good practitioners do when working solo. The term "agile" was coined in 2001 to describe a "bottom-up" style of software project management based on short iterations and frequent feedback from both developers and customers. Agile development practices are almost as old as programming, but they came into their own with the rise of the World Wide Web. First, the web made it possible to "release" software weekly, daily, or even hourly, since updating a server is a lot faster, and a lot less expensive, than shipping CDs to thousands of people. Second, during the 1990s and early 2000s it seemed as if web programming tools were changing every single day. Multi-year development plans didn't make a lot of sense when everything they depended on would be obsolete by the time work started, much less by the time it finished. Third, the growth of the web was aided by, and fuelled, the growth of the open source movement. People couldn't help noticing that most open source projects didn't have long-range plans, but nevertheless produced high-quality software faster than many closed-source commercial projects. 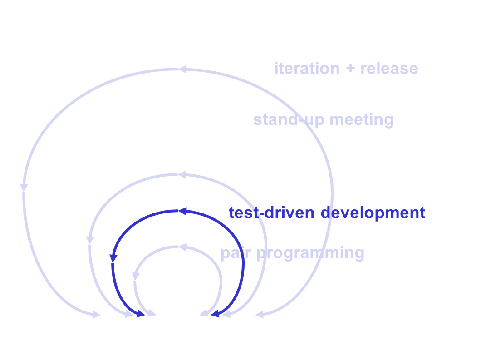 So what is agile software development? 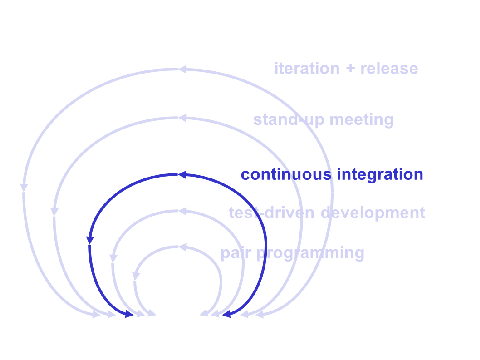 At its heart, it is any methodology that relies on continuous or nearly continuous feedback. Agile methods break development down into short iterations, typically no more than two weeks long, and often as short as a single day. In each iteration, the team decides what to build next, designs it, builds it, tests it, and delivers it. As they're doing this, feedback loops at several scales help them get it right, and do it better next time. This "exploratory" philosophy is why many people think that agile is a good way to develop research software. In most cases researchers are their own users, and often can't know what they should write next until they've seen the output of the current version of the program. Short iterations help improve efficiency in two other ways as well. First, most people can keep track of what they're doing for a few days at a time without elaborate Gantt charts, so short cycles allow them to spend proportionally less time coordinating with one another. Second, finding bugs becomes easier: instead of looking through weeks' or months' worth of software to find out where the problem is, developers usually only have to look at what's been written in the last few days. So what does agile development look like in practice? Once again, the key element is feedback loops. A typical working day starts with a stand-up meeting where everyone in the team reports what they did the day before, what they're planning to do that day, and what's blocking them (if anything). It's called a "stand-up" meeting because it's usually held standing up, which encourages people to stay focused. For example, suppose Wolfman, Dracula, Frankenstein, and the Mummy are working on some new mind control software. Yesterday: fixed the bug that was making the message file reader crash on accented characters, and added code to the web page generator to display accented characters properly. Today: will get message file reader to recognize links to images and load those images. Blockers: what should the message file reader do if the image is on the web instead of local? Should it try to read it, or is that a security hole? The key to making this work is that each task is at most a day long. Anything longer is broken into sub-tasks so that there's something substantial to report at every meeting. Without this rule, it's all too easy for someone to say, "Still working on X," several days in a row, which means that feedback, and the possibility of early course correction, are lost. Once the stand-up meeting is over, everyone gets back to work. The "driver", does the typing, while the "navigator" watches and comments. Every hour or so, the pair switches roles. Pair programming is beneficial for several reasons. First, the navigator will often notice mistakes in the driver's code, or remember design decisions that the driver is too busy typing to recall. 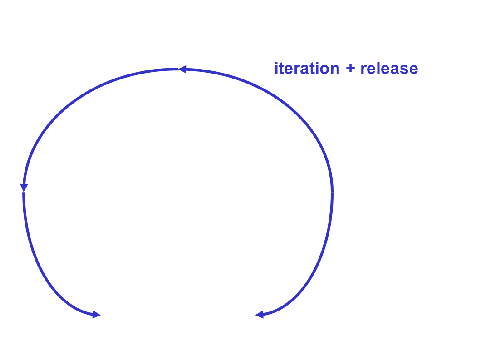 This is the tightest of the feedback loops that make agile work, since feedback is nearly continuous. Second, pair programming spreads knowledge around: every piece of code has been seen by at least two people, which reduces the risk of "But I didn't know" mistakes. It also helps people pick up new skills: if you have just seen someone do something with two clicks, you will probably do it that way when it's your turn to drive, rather than spending two minutes doing it the way you always have. 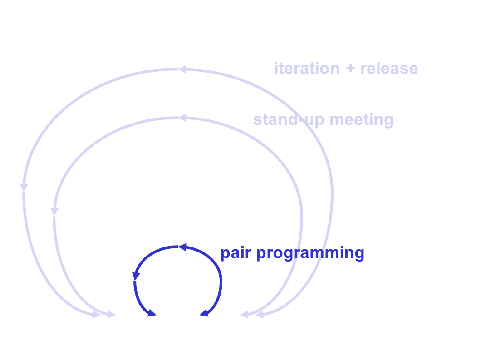 As well as pair programming, most agile teams use two other practices. commit it to version control. TDD's advocates claim that writing tests first focuses people's minds on what their code is supposed to before they're psychologically biased in favor of it being supposed to do whatever they've just written actually does. It also helps ensure that code actually is testable: all too often, if someone spends a day writing software, they'll only discover at the end that there's no easy way to set up tests cases, run them, or check the results. Every few minutes, or every time someone commits code to the version control repository, an automated process checks out a clean copy of the code, builds it, runs all the tests, and posts the results somewhere, such as a web page. If any of the tests fail, the continuous integration system notifies people by sending out email, texting them, or making the red light in the coffee room start blinking. We're not kidding about the blinking light: the more obvious it is that something's broken, the faster people will fix it, and the less likely they are to shame themselves by breaking it again. Continuous integration is the reality check that ensures that the software is always in a runnable state, so that it's always ready to give to users. Like TDD, it encourages people to work in small steps, which in turn makes short iterations possible. Together, the two practices give developers more feedback: TDD lets them see how their design decisions are going to play out before they're committed to a particular implementation, while continuous integration tells them (and everyone else) when they've forgotten something, or broken something that was working a moment ago. So, is agile development right for you? Requirements are constantly changing, i.e., long-range planning isn't possible anyway. This is often the case for scientific research, particularly at the small scale. Developers and users can communicate continuously, or at worst daily or weekly. Again, this is normal for small-scale research, where developers and users are the same people. 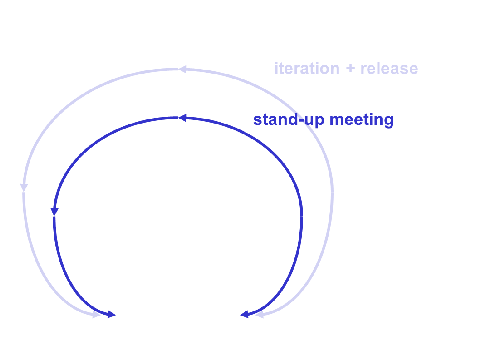 The team is small, so that everyone can take part in a single stand-up meeting. This is usually also true, though getting everyone to show up for a morning meeting is a challenge in many labs. Team members are disciplined enough not to use "agile" as an excuse for cowboy coding. They actually like being empowered. The last two points are the most important. Most developers don't like writing plans before they code, or documentation when they're done. Coincidentally, agile doesn't require them to do much of either. It's therefore all too common for developers to say "we're agile" when what they mean is "we're not going to bother doing anything we don't want to". In reality, agile requires more discipline, not less, just as improvising well requires even more musical talent than playing a score exactly. On the flip side, many people don't like making decisions. After two decades of schooling, they want to be told what the assignment is and exactly what they have to do to get an 'A', a 'B', or whatever grade they're shooting for. Many become quite defensive when told that figuring out what to do is now part of their job, but that's as essential to agile development as it is to scientific research.